What better way to hammer home the message that you're craftying up your beer offering than brewing your own beer? That's what the guys at Melbourne's Fancy Hank's decided to do – and not in the form of banging a Fancy Hank's logo onto some faceless lager brewed by an unnamed local brewery. No, instead they joined forces with the brewing team at nearby Two Birds and joined them at their Spotswood "Nest" for the brew day. Given they're above all else a BBQ joint, the beer was designed to reflect the food and mood of the venue. 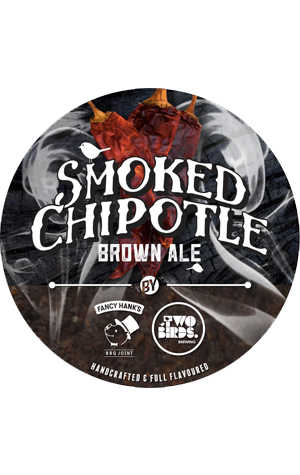 It's Smoked Chipotle Brown Ale that takes the rich, maltiness of a brown ale base (in itself the sort of style that suits the world of smoky meats anyway) and has some fun. The fun comes in the form of both Cherrywood and Mesquite smoked malts, used "to impart a distinct and smoky note". And, on top of that, chipotle peppers were added twice in the brewing process for "a hint of heat". Apparently Hank "hasn’t been this excited since he tasted his first beef brisket at age six". If you're keen to find out why, the beer's on at Hank's as well as Two Birds' Nest.